Cynthia Voigt’s first book in a three-book series Mister Max: The Book of Lost Things is written in the same style as Lemony Snicket’s A Series of Unfortunate Events. Like the children in the Snicket series, Max Starling is an orphan. 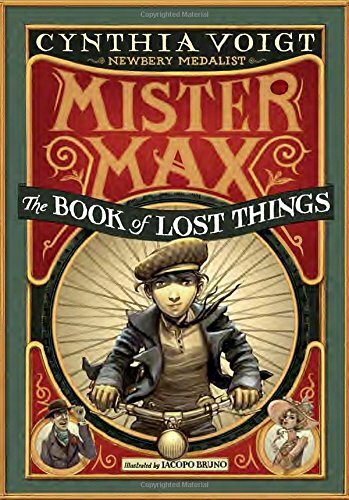 It is a book of lost things because Max feels quite lost, and his attempts to be independent result in his ability to find who he is while he helps others find something or someone. William and Mary Starling, Max’s parents, are the exuberant owners of the Starling Theatrical Company. William Starling is a talented actor, but a fly-by-the-seat-of-his-pants kind of father who loves adventure. Mary Starling is also a talented actress who enjoys adventure. Max is their only child, and he doesn’t seem to have any particular talent. He’s an ordinary boy who tends to blend in with the stage before him—his parents’ lifestyles. This turns out to be a valuable skill. He spends most of his time around the theatre with his parents, helping and observing. To avoid being noticed and seen as an orphan, Max uses the only skills he knows well—from the theatre—acting. ‘Lady pays,’ he answered. He concentrated on acting like Greek Jonny, one of the unsuccessful suitors in Adorable Arabella. Max also has to find work, so he can earn enough money to take care of himself. Max’s grandmother, a librarian, doesn’t have the financial means to care for him. Despite Max’s efforts, he is unable to find work—until one day the work suddenly finds him. Max finds a toddler, a dog, missing magazines from the library, a spoon, and just a touch of humility within an unexpected character in the book. Various friends along the way also help Max find himself. He becomes known around the town as a skilled detective and a great problem solver. But he still has not solved the mystery of his parents’ whereabouts. Was his abandonment planned? Are his parents in trouble? A newspaper article suggests that there is trouble for someone. And so the mystery continues. How long will Max need to earn his living? How long can he safely be independent and undetected? Readers will enjoy following Max’s adventures, laughing about mistaken identities and perceptions, and reading the next book to find out what happens.